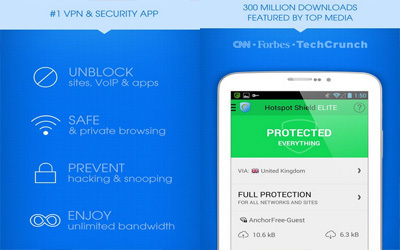 Previous version Hotspot Shield VPN 5.1.1 apk for Android will help you to downgrade or install older app easily. This is one of the best Tools apps. It allows you to bypass filters and firewalls that defined the network administrator to obtain your favorite content. You can now surf through the contents on Twitter, Facebook, or YouTube are blocked. Privacy and security are offered, you can surf anonymous. The app can create an encrypted so that your activities in cyberspace cannot be tracked or spied. Surfing became more private and comfortable. You will be protected from the attackers who can steal your personal data. It offers a high level of online security. All transactions and instant messaging that you do will be encrypted so that all your personal information is hidden safely through a new IP Address that hides the original one. Hotspot Shield VPN for Android user interface is quite simple. You will get three choices when opening applications that connect, upgrade, and share. This application has a simple and easy to understand. For Android phones and iPhones, this app can perform data compression. Compression of web content will be a saving and prevent an increase in the cost of the data used. For those of you who are often connected to public Wi-Fi, without a guaranteed security then your data will be easily monitored by the network administrator for monitoring. By using it, web browsing session you will be safe. Besides your personal data will also stores privately. It got better since the last time I used it. Very good, easy to use and keeps you protected well.